The digital collections of the Greek State Archives offer a wealth of information to those of us interested in Greek genealogy. 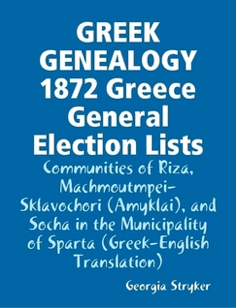 Included are the "General Election Lists" for each Municipality. Each row includes: Line # - Given Name, Surname - Age - Father's Name - Occupation. This is a GREAT resource, but very difficult to navigate for those who do not read Greek. I have translated these pages and made them available in both Greek and English for the communities of Riza, Machmoutmpei-Sklavochori (Amyklai), and Socha in the Municipality of Sparta, Lakonia. Hi, do you know anything about whether the lists for Larissa exist online yet? I have not translated any of those records yet. Keep checking back.